TDM INFORMATION TECHNOLOGY: Handy Backup - Giải pháp Backup và phục hồi dữ liệu cho File - Folder - Ổ đĩa. Handy Backup - Giải pháp Backup và phục hồi dữ liệu cho File - Folder - Ổ đĩa. Handy Backup allows you to perform three types of operations: backup, restore and synchronization. 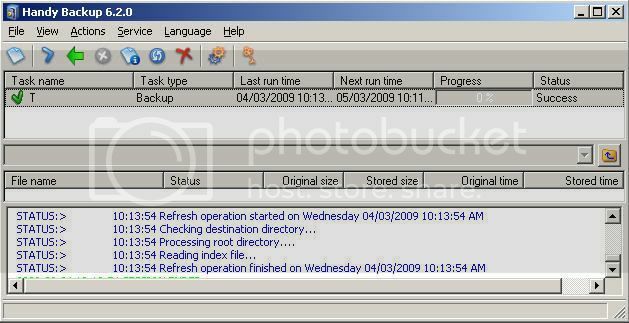 Incremental backup – the program checks for changes in file sizes or modification times since the previous backup, and copies only those files that have been altered. Advantages of this backup type are quite obvious: fewer amounts of data to operate with and noticeably less time to perform the operation. Handy Backup supports two principal backup technologies: files-based backup and image-based backup. While files-based backup can be used to copy data represented in the file system as separate files only, image-based backup allows you to perform physical duplicating of your disk and create drive images that contain all system data. Note: If you select incremental backup when backing up for the first time, the program will perform a full backup. The next time you will launch the task, it will perform incremental backup. Incremental restore – the program checks for changes in file sizes or modification times since the previous restore, and restores only those files that have been altered. Handy Backup allows you to restore your data to their original locations, or select any different local or network location. Mirroring both folders – the program makes contents of both folders identical. Synchronization task has several options that allow specifying files priorities, using file masks for files selection, etc.